A few weeks ago I had an incredible vegan meal at a little spot right around the corner from my old stomping grounds in the West Village. I was equally excited to be dining in the old hood as I was to be sharing a meal with some of my favorite people. The delicious food was a bonus and served as a little inspiration in my own kitchen. My friend had raved about Blossom for some time so I decided it was finally time to see what all of the fuss was about. Among a table of unique cocktails, pizza that you would never know was vegan, and many other knock your socks off dishes, stood my favorite plate of the night – their vegan risotto. A few weeks later, I decided it was time to attempt making the vegan risotto myself. To make the cashew cream, blend raw cashews and water in food processor until smooth. Start with 1/2 a cup of water and add a bit more if too thick. Place slices of pumpkin in a pan with a little olive oil and roast at 400 degrees while risotto is cooking, keeping an eye on it to make sure it doesn’t burn or crisp (about 15 minutes). In a pot (I used a Le Creuset), saute shallots in olive oil over medium heat until they begin to soften and become translucent. Continue to cook over low-medium heat for a few more minutes. Add white wine to the vegetable broth and add 1/2 cup of the liquid to the pot and then add rice – there should be enough liquid to just cover the rice – add more if necessary. Cook over medium heat, stirring occasionally. As liquid absorbes continue to add more – about 1/2 a cup at a time. Continue stirring after you add more liquid. After about 15-20 minutes, rice should begin to soften. When rice is fully cooked (give it a taste to see if it is soft), mix in the cashew cream. Add lemon zest and mix. 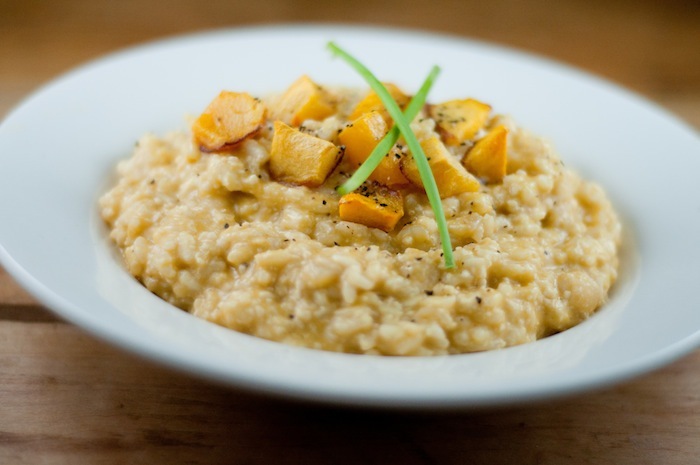 Remove pumpkin from the oven and mix into risotto. This entry was posted in Recipes and tagged arborio rice, cashews, extra virgin olive oil, Lemon Zest, pumpkin, Shallots, sherry. I made this last Saturday night and everyone LOVED it! It was flavorful without being too heavy or rich, and I got to showcase the pumpkin that I purchased at our local farmer’s market. It also made for delicious leftovers the next day! Thank you for the recipe!